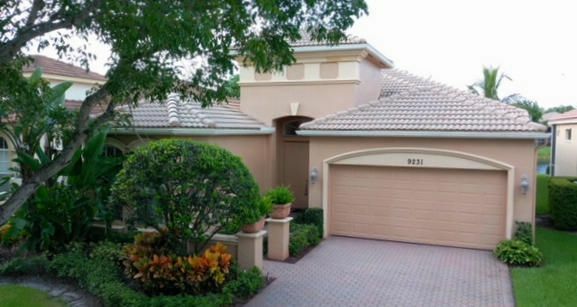 Come see this immaculate lakefront 2 bedroom / 2.5 bathroom single story home in the exclusive community of Buena Vida. As you enter this stunning home you can see all the meticulous details including the diagonal shaped tile, wall sconces, high hat lighting and the open floor plan. The guest bedroom is at the front of the home and has its own bathroom, whereas the large master is at the back of the home and has an ensuite bathroom dual sinks, a separate tub and an oversized shower. In the center of the home is the den with an amazing built-in bookshelf / desk combo and the dining / living room. The back of the home has the family room and kitchen that features stainless steel appliances, wood cabinetry and granite counters. The home has been freshly painted, has new a/c & new carpeting. This home is located in BUENA VIDA 55+ Active Adult Community. As an Active Adult Community Specialist for over 16 years, I know these communities very well. I am a real estate agent who cares. I don't just want to sell you a house, I want to sell you the perfect home that will fit your needs as well as your lifestyle. I live and play in an active adult community and the lifestyle is wonderful. Country Club living without the country club fees. To All of my baby boomers not quite 55 years old who want to live in a 55 plus community, please call me for a list of Active Adult Communities that will allow you to live in some of these wonderful communities! Please call me with any questions that you may have at (561)-306-7430.